Don’t bring up global warming. Don’t sound like you are telling other people how to live their lives. Wear a suit during your conversation. And for God’s sake, don’t fawn over the Dutch. He doesn’t say so outright, but the fact that he has written this post would seem to acknowledge that there is indeed some kind of backlash brewing against cyclists — at least out in the wackier reaches of the political landscape. This left cycling happily by the side of the road when it came to politics. These days are ending. In fact, I think the reason some people are so bent out of shape about cyclists is the very fact that cycling is growing outside of said realms. And in doing so, bicycles have found themselves tethered to political issues such as global warming, terrorism and war, not to mention the epidemic of milk crate theft. So, we’ve gone into the mud bog. Look, I promise I’m going to just get over it. It was bound to happen. It’s probably a good thing in the long run. But how to respond to this changing landscape? The “How to Talk to a Conservative” post got me thinking. Sure, I can do the things Bowden suggests. I can say that cycling saves money, is good for my heart and reduces our need for Saudi Arabian oil. I don’t think these people’s criticism of cycling is really about cycling at all. I’m not sure that is is the bicycle itself that raises their ire. I’m sure many of them rode bicycles themselves back when they were 10 years old and developing their superior work ethics by tossing newspapers onto front porches. No, I think the backlash has to do with a sense that the increasing tide of “urban cycling” may be saying something unkind about their own way of life — a way of life that includes a warm coziness with the device known as the internal combustion engine. Let’s think about the internal combustion engine and all that it represents: It is loud. It is smelly. It is powerful. It makes possible NASCAR — not to mention the M1A2 Abrams battle tank (which, astoundingly, weighs 70 tons and can go 42 mph). But this is AMERICA! And we have earned it all, dammit. So. Contrast this with the bicycle. How wimpy, cheap, quiet and humble it seems. A sorry wallflower. You know, rolling on down to the farmers market to pick up a head of lettuce. You could even try to entice your conservative friend by pointing out — if you didn’t think it crass and shallow to say so — that pedaling a bicycle has beneficial effects on the appearance of one’s legs. But it probably is crass and shallow, so we won’t mention that. But none of this will do us any good in coaxing them over into the bike lane. And that’s really what we want, isn’t it? Because, dammit, we don’t want to simply talk to them about cycling. We do, in fact, want to tell them how to live their lives. So, being the pragmatic sort that we are here at EugeneBicyclist, we think it is sometimes necessary to engage our enemies using the fine art of political compromise. This approach may offend the highly principled or more militant among you. But, look, would you rather keep your principles, or get something done? Go ask the president about that. Yes, unsavory as it may be, I think we have found our way forward. There I was tooling out Highway 99 a few weeks ago, thinking about what to get for that hard-to-buy-for conservative on my Christmas shopping list, and … bingo! Motors kits! It’s bike and an internal combustion engine. By the way, I was out here this past weekend, a full week after Christmas, and the marquee still said: “ORDER BIKE MOTOR KITS FOR XMAS.” So it’s not too late. If you can’t read that, it says: “PLEASE LEAVE MOWERS OUTSIDE.” Lest your the kind who doesn’t go anywhere without your mower. But let’s get back to motorized bicycles. I do encounter these around town occasionally. This summer, for instance, I was on High Street, getting ready to turn right onto Fourth Avenue, to head toward the EWEB building. A motorized bicycle crossed the intersection in front of me. Without really thinking, I charged after him. Why? Because he was there. And because I am that way sometimes. And because he had a motor on his bike! When we got onto that little rise right in front of EWEB, as the road bends up toward the Ferry Street Bridge, I decided to launch my attack. I sailed past him like I was Alberto Contador — which I am pretty sure I am not, based among other things on the fact that my Spanish is halting and I do not generally like to pretend that my finger is a pistol. Want some more of that? Make my day! You can see he also appears to have in his basket not a lovely verdant head of lettuce, but a spare fuel can. Sadly, though, my attack, did not last. As I came down the north side of the bridge, having lost the advantage of the small climb, the dude on the motorized bicycle passed me — although at this point he was out in the street, and he went roaring past out in traffic on the Ferry Street Bridge. He ended up taking the on-ramp to the I-105 headed toward Springfield. 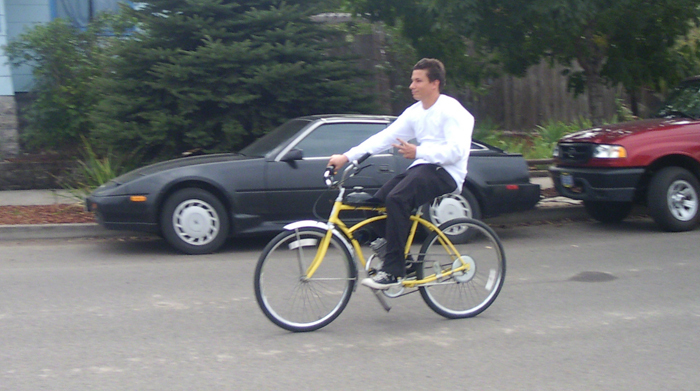 Now, if you’re curious about riding a motorized bicycle, here’s another guy I spotted not far from downtown, at the big Methodist church by Charnelton and 14th. He offers a fine demonstration. Step 1: Prepare to mount. Step 2: Fire it up, ejaculating a satisfying white cloud of fine particulate matter and CO2. Don’t get me wrong.. I’m keeping my pedals turning, but it may if it’s ride or no ride, electric might be a better answer. There’s at least one guy here in Flagstaff with one of those motor kits on his bike. Once I encountered him waiting at a bus stop, with his bike, intending to put his bike on the bike rack of the bus. That was kind of a head scratcher, given that weather was clear and the streets were dry. I speculated that he was out of gas. But when he realized that the two available bike slots would be taken (by my stepdaughter and me), he fired up that lawnmower motor and putted away. Was it a matter of cost? Does it cost less to take the bus than to run that little motor? Or maybe he had a pass or transfer, and he figured that he might as well save on gas, since the bus ride was already paid for. If I see that guy again, I may try to chase him down and find out. 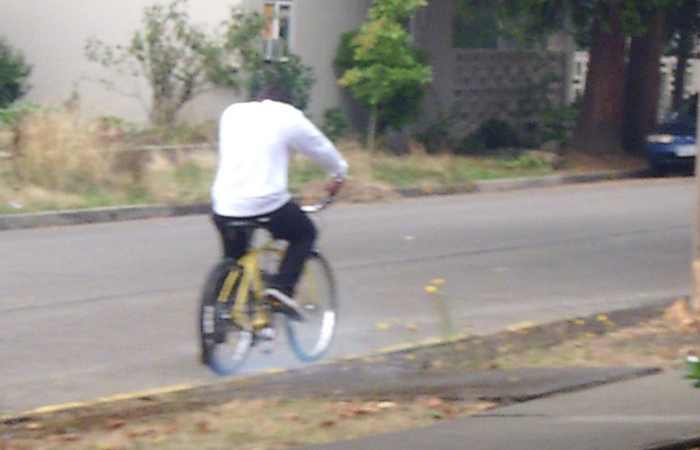 So I don’t think you can actually call these “Bikes” according to the Oregon Revised Statutes. A Moped or Motor Assisted Scooter yes, but not a bike. And therefore they cannot legally use the bike lane, bike path, sidewalk or other facility where bikes can legally ride and mopeds and motorized scooters cannot. Shane, you are right on the money. I don’t give a rip if fat-assed frat boys or clueless crones tool around town on a bike with a motor or not. At least they are not doing it in a car. I suspect the asshats who sell these things are telling people it is legal. Legal or not, the city won’t do jack about it so I guess these sociopaths will continue their behavior. BTW, when I was complaining to the city about UO’s practice of running golf carts and small trucks (yes, small trucks) on the paths between campus and Autzen Correctional Facility, some PR flak at the city told me that she “thought there was an informal agreement between the city and UO to allow UO to do that.” I checked with ODOT and they let me know this was a lie. Local government does not, it seems, have the authority to abrogate state law. Who woulda thunk it? Every night at about dusk a guy has been flying up the steep hill I live on. I assumed he was an extremely strong rider but the night before last I heard a slight “whirr” sound and stopped him on the way up the hill. He was more than happy to tell me about his bike. It is an electric conversion kit from a company called Ampedbikes. He went on to tell me he uses it to commute 31 miles each way to his work and home. He went on to say that he gets exercise but does not show up sweaty to work. I have a mantague paratrooper and pulled the trigger and ordered myself one of the Amped rear kits. I am curious as to how legal these motorized bikes really are. I have one my self. Ive seen police look at me, follow me, and then go on with their day after I assume they ask dispatch if they can stop me. I’ve heard of police in salem and portland considering them “mopeds” and therefore would need registration and insurance and such. But here, everyone I know with these bikes insist that the police never bother them because they also fall under the “power assisted scooter” definition. Which only requires that they not exceed 24 MPH and 33cc. Who cares if somebody wants to have a motor on their bike. Worry about yourself y’all, sound like a bunch of communist!